If You are a sport lover, Geneva is a place to be! Thanks to it's beautiful surroundings and close proximity to mountains and lake, You can do all kinds of sports - hiking, skiing and snowboarding at surrounding mountains, paragliding from the Mont Saléve, wakeboarding, kitesurfing or diving in the lake. Many bike trails will help You to discover surrounding country side. There are many opportunities to do sports even without leaving Geneva city: running around the beautiful lakeside, swimming in one of the swimming pools or in the lake itself during hot sunny days, playing all kind of sports such as football, squash, tennis, wolleyball or slacklining or doing yoga in some of Geneva's yoga centers or parks. Dive into refreshing water even in one of Geneva's indoor swimming pools or, when hot (July-Sep) take a swim in the lake. Swimming centres fees starts at CHF6 per entry (unlimited) and entry also provides access to sauna and outdoor yard for sunbathing. There are several beautiful bike routes in a nature around the city and lake. It is easy to rent a bike for few hours or few days, or buy a new or second hand bike. Whether You are looking for short walk in the nature or another big challange, Geneva's countryside wih it's mountains offers everything to fulfill Your needs. Beautiful countryside with it's small Swiss and French villages immediately surrounding the city; Jura mountains on the west; Saleve on the south and French Alps on the south-east all provide truly breathtaking hikes for every nature lovers. Some fitness centres and gyms are for permanent attendants, but most of them are available even for one entry. California fittness is the good choice for more demanding customer. Bikram Yoga opened recently in Geneva, offering 30 days unlimied access for only CHF 89. South from Geneva city, about 10km by car, is a huge steep rocky mountain Mont du Salève, which is a paraglider's paradise. There is a Swiss and French Paragliding Club, jumping from the Saleve mountain. For paragliding in Switzerland You need to have a permission and insurance, for which You need to have at least level 3 in paragliding. However, Saleve is just behind the border in France and French laws are - You don't need any pemit, only insurance which is not expensive. Kitesurfing is not allowed in the lake around the Geneva city, so people are going little further, to French side of the lake. 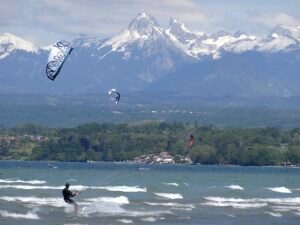 The best and most popular place for kitesurfing not far from Geneva is Excenevex - exact coordinates of parking lot and beach are: 46.350506,6.357524. The water here is shalow and wind conditions very good, however not so stable as it used to be. Free to kitesurf throught the year. In summer, months June-September, the place gets the most cowded by kitesurfers. Also the sand beach becomes popular bathing place for locals. In this months, kitesurfers have their 300 meters long water passage definet by the yellow seamarks which serves as an entrance deeper into the lake and after that, they are free to kite anywhere. On the Excenevex beach are also several restaurants and bars. Parking at the official parking lot costs 4euros payable only in coins. There is however free parking lot next by, for the clients of the local restaurant. Another good place for kitesurfing is in Versoix. Wakeboarding in Geneva is either behind the boat, or while beeing pulled by water lift (Tropical corner). Bit further from Geneva is TNA Arenthon, much bigger water lift. One of the biggest and most famous bungee jumping place in the world! Jump heights - from 70m to 220m. Prices for jump start at CHF 255 for adults (children up to 19yo - 195). For more various activities, see our guide to activities around Geneva.